Monarch butterflies (Danaus plexippus) are one of the world's most well-known and beloved insects. In North America their spectacular migratory behavior makes them a flagship species, not just for insects but for all migratory species. 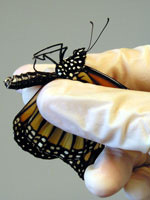 A network of North American monitoring programs, some focused solely on the monarch butterfly – and some focused on all butterflies, gather data on all stages of their migratory cycle. The mission of MonarchNet is to create a central website where everyone can gain access to information about monarch monitoring programs, learn how to access the data, and find tools for data visualization to learn about monarch dynamics throughout North America. This website serves as a resource for anyone who wants to know about monarch populations, i.e. government officials, researchers, members of the general public or NGOs. Since the partners represent the most important monitoring programs that collect data on monarchs, the collective data represent the most current and comprehensive information on the monarch biology. We hope that linking the data sets our efforts will foster collaboration between monitoring programs, promote the use of the data to answer scientific questions, increase participation by citizen-scientists in multiple programs, and increase awareness of each monitoring program. about his interest in butterflies. 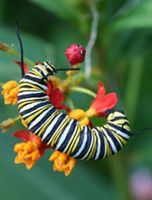 MonarchNet: Why are you interested in butterflies and caterpillars?